The Villas at Casa da Breia are in a beautiful spot, surrounded by vineyards with magnificent views over the estate and, to the hills of the Peneda Geres National Park. On entering the walled estate from the main road there is approximately 500 metres of private road leading to the Manor House and villas. The owner lives in the Manor House with their four delightful children. Fully fitted kitchen with dishwasher. The living room has a sofa bed which is suitable for one child. Double bedroom with ensuite shower room. Steps down from the living room lead to a twin bedroom with ensuite bathroom. The 'open plan' living room, with a sofa bed suitable for two children or one adult, has a kitchenette which is concealed behind doors. An upper level 'open plan' living room, reached by stone steps from outside, with a kitchenette. Steps lead down to a twin bedroom with ensuite bathroom containing a mini bath. This cottage is not suitable for young children because of the stone steps. Independent cottage with 1 twin and 1 double bedroom and 1 bathroom. A few steps lead to an upper level living room with doors opening to an outside private patio with barbecue. Kitchenette with microwave, electric ring cooker and oven. Three twin bedrooms, three bathrooms, living room, dining room and fully equipped kitchen. Private garden and swimming pool. There is also a washing machine in the property available for guests usage. The guests in the villas are free to enjoy the gardens in the grounds which offer shady places to sit and relax. For children, there is a small play area with swings, tennis table, badmington and football table. 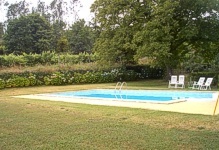 The swimming pool, with integral steps, is situated approximately 100 metres from the villas. The pool has a current to swim against. Guests can use the bicycles at the house. Many interesting, beautiful places are within easy reach of Casa da Breia, including the old sailing town of Viana do Castelo, the National Park, Braga, Guimaraes, Porto and, Vigo, Baiona and Santiago de Compostela in the Galicia region of Spain. The market towns of Ponte de Lima, Arcos de Valdevez and Ponte de Barca, with shops and restaurants, are all approximately 10 minutes away by car. Ponte de Lima has an excellent golf course. There is a small shop approximately 500 metres away and a small village 2 kilometres away. The local 'festa' , which takes place in the first week in July, is very colourful however, the noise of music from the church speakers makes it noisy at the villas.